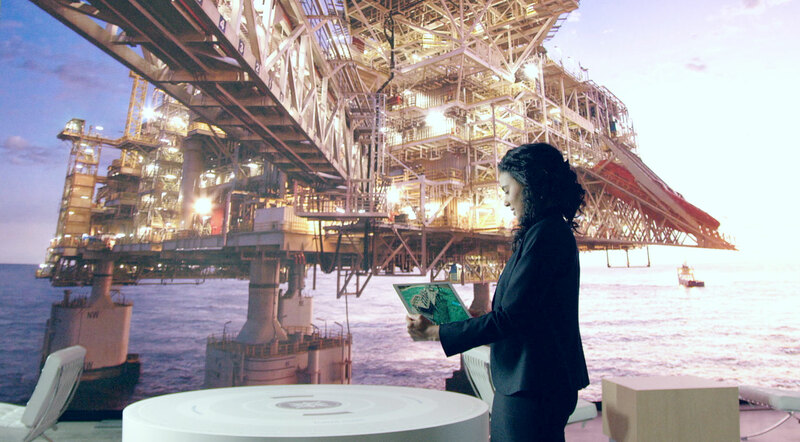 Using Augmented Reality to showcase Chevron’s commitment to environmental responsibility. How do you engage high-value decisionmakers with an interactive experience that positions Chevron as an innovative and tech-forward company? Tabletop AR: We fabricated custom compass tabletop graphics to ground the experience in the event space and act as markers that trigger the AR content. Protecting the Island: We showcased how Chevron protects Barrow Island’s natural fauna and biodiversity through strict quarantine measures. Discovering the Wildlife: We brought the island’s actual wildlife to life by dropping to-scale animated animals right on the table. Powering the Region: We explained how Chevron transports the LNG safely to Japan, China, South Korea, and other parts of Australia. Cinemagraph Content: The 15-foot LED wall features beautiful content that complements the exhibit space’s premium feel. The World Gas Conference is the most important global gas industry gathering of influential leaders, policy-makers, buyers, sellers, and experts. Chevron was looking to engage these high-value customers and decision makers by creating an immersive exhibit space that would showcase Chevron’s commitment to environmental responsibility and position the brand as an innovative and tech-forward company. 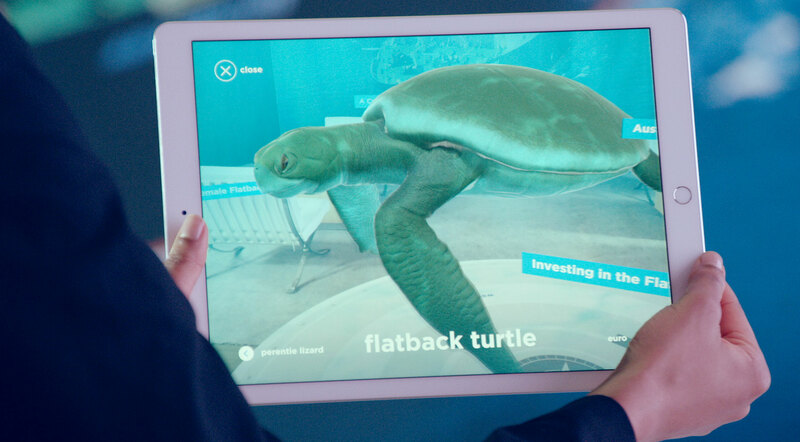 Firstborn created an interactive event installation featuring an augmented reality (AR) experience that educates conference attendees about Chevron’s commitment to providing energy responsibly while protecting and preserving natural environments. 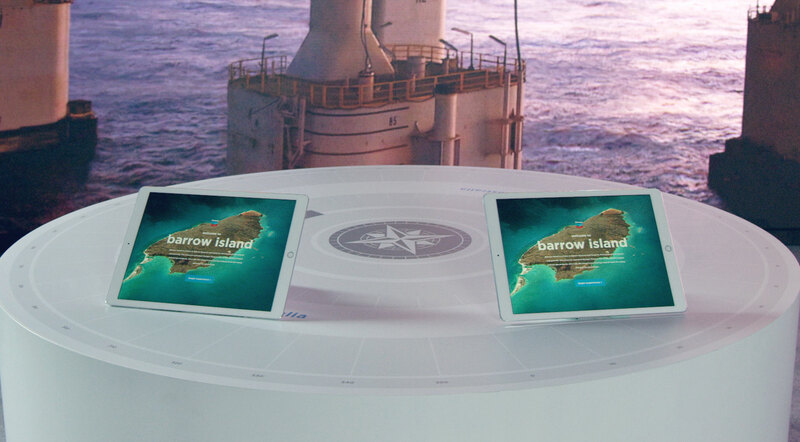 The AR experience showcases Chevron’s Gorgon Project, a Liquefied Natural Gas (LNG) project that operates within the Barrow Island nature reserve, as a perfect case study of energy and environment coexisting in Western Australia. 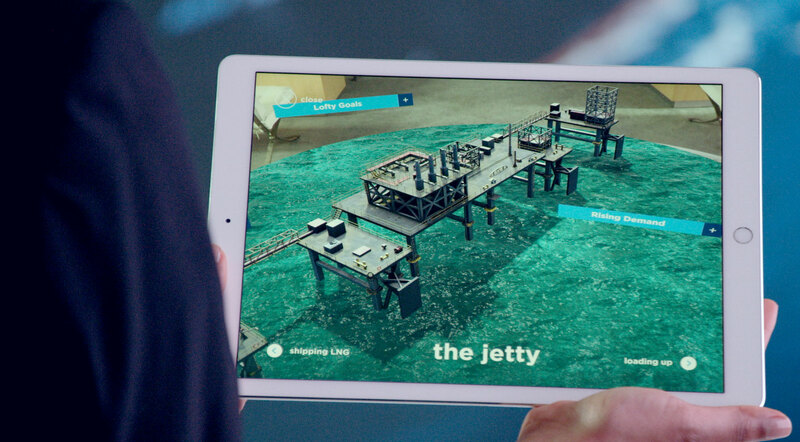 The AR app encourages users to explore the island to discover how one of the world’s largest natural gas projects successfully coexists with this unique environment while helping power the Asia Pacific region. ●	Chapter 1: Protecting the Island: Explains Chevron’s unique Quarantine Management System that helps keep the island safe and the environment pristine. ●	Chapter 2: Discovering the Wildlife: Teaches users about the unique wildlife found on the island by dropping life-sized land and sea animals on the tabletop experience. The animals are textured and animated in real-time through Unity and are camera-aware. ●	Chapter 3: Powering the Region: Describes how the LNG is shipped from Barrow Island to customers as far away as Japan. The exhibit also features a fifteen-foot tall LED video wall that serves as the focal point of the booth, differentiating Chevron’s presence from its primary competitors. The video content includes hi-res cinemagraph animations and interstitials that grab the attention of event-goers—all while subtly surfacing key brand messaging. 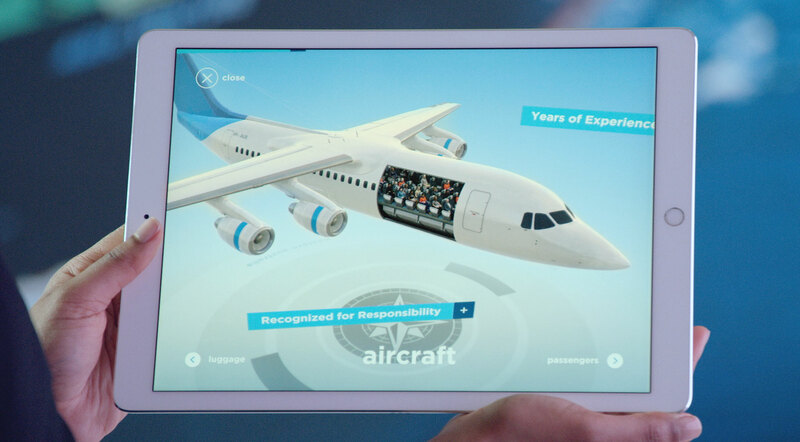 To deliver additional reach for the AR experience beyond the conference, we also teamed up with the Washington Post to help the publisher create a version of the experience for their App. The event exhibit and AR experience illustrated why Chevron is the partner of choice for bringing reliable liquefied natural gas (LNG) to over 12,000 attendees. The activation brings to life the brand’s legacy in reliable energy supply, environmental management, and innovative technology expertise.